Cafe Vue Open 05:30 – 00:00 daily. 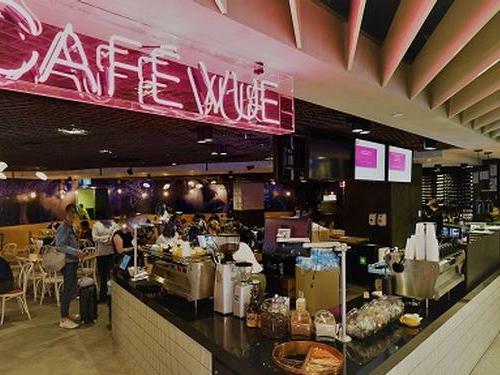 Café Vue caters to a hectic city crowd with ease and speed. Enjoy delicious French fare for breakfast and lunch, such as toasted sourdough and fruit bread baked fresh on site daily. For later in the day enjoy French onion soup or a burger with (French) fries or simply grab a Café Vue dinner box to take on the flight. Airside – after Passport Control and Duty Free, Level 1. Café Vue is located on the right hand side at the end of the luxury retail area. International flights only.